We Help Our Clients Accomplish Their Goals! Since 2002 we've designed shows that get great results for businesses! We'll collaborate with you to create effective video strategies that help you reach, teach, persuade, convert and profit. Whether you're a start-up, small business, mid to large sized business or Fortune 500 company, we can do this within your budget. See what our clients say about us here. "My company worked with Ball Media Innovations to produce a short but inspirational video. From start to finish, the project was handled with professionalism and a strong attention to detail. The finished product exceeded our expectations and we certainly would not hesitate to work with Greg and the folks at Ball Media Innovations again." To our knowledge, we're the ONLY one among Miami video production companies to have business and training schooling and hands-on real life business and corporate experience. We know how to apply this to increase the effectiveness and power of your videos. We'll become a member of your team member, and we'll get to know your brand, products, services and goals so that we can design videos that work for you. We offer this to you with no extra costs, and we'll price your production within your budget. As Miami's most qualified business video production company, we can create website & social media videos that help bring you traffic, generate interest, and convert viewers to buyers. Businesses trust us with their promo videos because we understand the concepts that go behind reaching and converting your target market. We're top among Miami video production companies for marketing. Other Specialties of ours include video for Manufacturing — Training — Medical Videography — Public Relations. Call now for a quote. We'll discuss your needs, exactly what you're trying to get across and what your goals are. We'll share some of our own ideas with you, and there's no obligation. We'll Pamper You with Great Service! Our goal is to give you an easy, pleasant experience. We consistently go above and beyond expectations. Plus we keep our clients updated, we show up when we're supposed to, and we give fast responses, along with friendly and respectful communications. We treat you as we'd like to be treated. "Ball Media Innovations is a first class company that has the 'we will do what it takes to be sure you are pleased' philosophy that is unfortunately rare to find these days... they are first class professionals. Every product has been of the highest quality. I feel extremely comfortable recommending Ball Media..."
"Ball Media Innovations made our Corporate Video project so easy and seamless. From managing the onsite video shoots and making my on-camera talent feel comfortable and at ease, to editing the clips into an impactful and effective story, everything Greg and his team did was with the upmost professionalism and talent. My management was EXTREMELY PLEASED with the product delivered..."
Greg is the epiphany of detail oriented and commitment to quality, he translated every aspect of what I wanted into a brilliant end product that exceeded my expectations, and which my customers:- healthcare providers and patients fell in love with at first viewing. I am looking forward to my next project with Ball Media as it will be a stress free experience to an outstanding product." 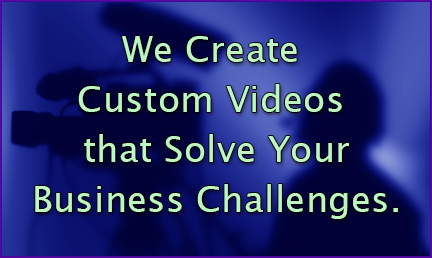 Small businesses need video in order to compete and grow. We'll help you with economical plans that can increase your bottom line. We offer Small Business Pricing Packages for the Miami, Fort Lauderdale and Palm Beach areas. Greg Ball, President of Ball Media Innovations has training theory education and extensive experience applying it to video. That makes us your best choice among Miami video production companies. We create effective training videos that really work. We've worked extensively with various manufacturing companies to produce videos, including plant tours, training videos, public relations and marketing videos, trade show videos, website videos, new employee orientation, etc. Ball Media Innovations has extensive experience creating successful videos for the medical community. From small practices to hospitals and medical manufacturers including GE Healthcare and Johnson & Johnson, we've had only satisfied clients. YOUR BEST CHOICE OF MIAMI VIDEO PRODUCTION COMPANIES! Top Among Miami Video Production Companies, we provide service throughout South Florida. We also offer video production crews in Orlando, and around the nation and the world, so if you have other locations where you need video shot, we can handle it! Outstanding Service: We believe it's imperative that we serve you reliably and consistently with extraordinary service. We understand that your happiness means everything, so we make it our business to make you happy! All the time. Check out more of our client testimonials, and you'll know what we're talking about. Outstanding Crews: Most video companies are sending out crew members who are basically newbies or just beyond that. So you'll end up with a poor quality video because it saves them money. Not us. We only used highly experienced, top-of-the-line team members on every project. We'd rather make less profit in order to keep our standards high. You'll see and experience the difference. Most of our video crews have shot for TV and movies, and all of them have worked for many years within the corporate video world. They're all managed by Greg Ball, who has over 25 years of success in the corporate video world. This is what makes us top among production companies. Click Here to check out our team. Happy Clients: Here's a tip. Make sure any company you're considering is showing testimonials from real customers. We add photos, full names and positions to the testimonials on our website so that you know they're real. We can also have you talk to other clients if you'd like. This should be a given! Read More About Why You Should Choose Ball Media Innovations. You can trust Ball Media Innovations as your Miami video production company, even with your most important projects.